"You should get a copy of this month's Reader's Digest. 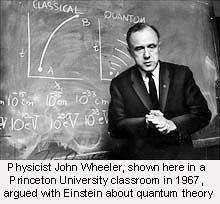 There is an article about a physicist, John Wheeler. You should get in touch with him." "But what should I tell him?" "Share with him some Chassidus (chassidic teaching), the Seven Noahide Laws, that kind of thing." My curiosity was piqued. Rabbi Schochet is a man who lives and breathes Torah from morning until night. Yet apparently not only does he read Reader's Digest, he is using it to single out a non-Jewish scientist to get close with. But once I read the article, it started to make sense. Wheeler is one of the world's leading physicists. At the time, he was putting out some very religious sounding statements in the name of hard-nosed science. "Is man an unimportant bit of dust on an unimportant planet in an unimportant galaxy somewhere in the vastness of space?" asks Wheeler. "No! The necessity to produce life lies at the centre of the universe's whole machinery and design....Without an observer, there are no laws of physics... Why should the universe exist at all? The explanation must be so simple and so beautiful that when we see it we will all say, 'How could it have been otherwise?...' Still needed today is a thinker... who can lead the way surefootedly through this world of mystery to insights overlooked or deemed impossible. I don't know how to. I don't know anyone who does. I can only say that when you see one who does, treasure him or her." So a scientist is reporting the discovery of a supernatural plan, the centrality of mankind in that plan, and the expectation that some individual will soon lead us to realize the purpose of creation. And all this is the rational conclusion of a physicist who collaborated with Niels Bohr to lay the groundwork for atomic energy, coined the phrase "black hole", and served as mentor for several Nobel laureates. I drafted a letter to Professor Wheeler and set out to look for where to deliver it. I called Reader's Digest. They couldn't help me. I looked for the author of the article, John Boslough, but I couldn't find him. I checked at the University of Texas at Austin where Professor Wheeler was reportedly working. They hadn't seen him for months. I tried tracking him through Europe and numerous other campuses, but no luck. And after a couple of days of this, I gave up. I decided to call several physicists and put them on the trail. I finally found Wheeler's personal secretary at Princeton. "I'm sorry sir, he's very busy for the next few months... Yes, I understand that your message is very important, but he's researching It From Bit and he's not taking any but the most urgent calls. You see he spends six months a year on a little island off Maine contemplating the creation of something from nothing." I packaged up a Tanya, the blueprint of Chassidic philosophy containing several chapters discussing the process and nature of creation ex nihilo. I included a letter explaining a little about the Rebbe, and how Chassidus has the answers to his questions regarding the origin, mechanism and purpose of the continuous creation of "something from nothing." "It is for me a precious remembrance of the life and teachings of the seventh Lubavitcher Rebbe to have as a kind gift from you the Tanya of the first Lubavitcher Rebbe. I thank you especially for marking passages that I might study with especial care. You will already have some notion of my sympathy for these general questions in what I have said or written about creation, for example, in the enclosed three pages of a paper of mine given at a joint meeting of the Royal Society and the American Philosophical Society." Dr Wheeler comments that, "In our time, the participants in the dialogue have changed. They are the universe and man. The universe, in the words of some who would aspire to speak for it, says, 'I am a giant machine. I supply the space and time for your existence. There was no before before I came into being, and there will be no after after I cease to exist. You are an unimportant bit of matter located in an unimportant galaxy.'" "How shall we reply? Shall we say, 'Yes, oh universe, without you I would not have been able to come into being. Yet you great system are made of phenomena; and every phenomenon rests on an act of observation. You could never even exist without elementary acts of registration such as mine.'?" This, in a nutshell, is the Jewish concept that "for my sake was the world created". Humanity was not created as part of the universe. The universe was created for humanity. Such a model requires the necessity of continuous creation, of humanity's unique role and purpose, and of a consciousness underlying the universe as a whole. It's actually quite poetic. First Abraham finds G-d through science. Then, some 3,700 years later, quantum physics finds G-d through science. And now John Wheeler finds out that Abraham had it right all along. As to Wheeler's search for a "thinker who can lead the way surefootedly through this world of mystery to insights overlooked or deemed impossible", I have done my small part by introducing the Rebbe and Chabad Chassidism to John Wheeler, with good results. What's left for us all is to follow Wheeler's concluding advice -- "Treasure him." The content on this page is produced by Chabad.org, and is copyrighted by the author, publisher and/or Chabad.org. If you enjoyed this article, we encourage you to distribute it further, provided that you comply with our copyright policy.